With limited space in a cruise ship cabin, it is more important than ever to pack right. We've put together 25 tips for packing less on a cruise vacation to help you be prepared. Cruise ship cabins are notorious for their small size and it can be frustrating to take a once-in-a-lifetime cruise vacation only to feel crowded and cramped in your stateroom. By carefully packing, however, you can easily fit everything you need in your luggage and stateroom without clutter, squeezing or leaving essential items behind. Why is it so important to minimize your luggage on a cruise? Cruise ships may claim their cabins have multiple closets and ample storage space, but that storage space is nearly always smaller than expected once you’re actually in the cabin. Closets are typically small, drawers are usually narrow and shelves are often tiny. Furthermore, some storage space is often taken up by mandatory life jackets or spare pillows and blankets, and you don’t want to be tripping over overflowing closets throughout your cruise. Take a look at these perfect storage items for your cruise cabin. The less you pack, the less hassle you’ll have getting your luggage on and off the ship, particularly if you opt for self-assist embarkation and debarkation and tote all your bags yourself. Less luggage also means you may avoid hefty baggage fees from airlines if you’re flying to and from your cruise. A little extra room in your luggage also gives you room to bring home souvenirs without overstuffing your bags. Fortunately, it is easier than many passengers realize to pack less for your cruise and still feel well-equipped for setting sail. It’s a strange, unwritten rule of packing that you inevitably fill up your bag, no matter what size it is. 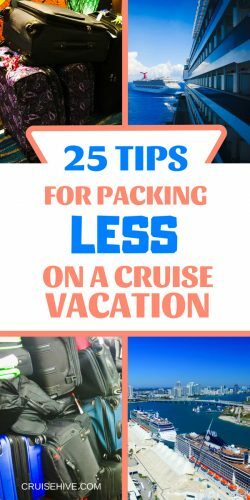 If you automatically start with smaller bags when packing for a cruise, you won’t be tempted to fill up extra space with too much stuff to fit in your cabin. 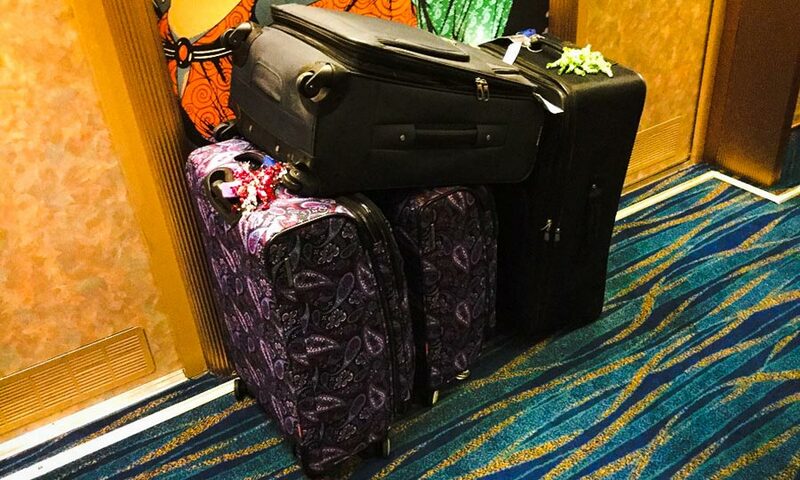 Soft-sided luggage may collapse easily to fit in smaller spaces, but it also expands more easily if you’re trying to cram too much into every corner. If you use hard-sided bags, you’ll have to pack more lightly to fit everything in, and what you do have in your bags will be more protected. Get your cruise inspired luggage from Amazon. Before packing, be sure your luggage is completely empty. You don’t want to waste space by accidentally taking along anything left in a hidden pocket during your last trip. Similarly, empty out your wallet or purse before your cruise so you aren’t taking along anything you won’t need. Don’t use valuable luggage space by packing extra empty bags. That beach bag you want for your day on the sand? Use it as a piece of luggage itself instead, already packed with your beach essentials so you’re ready to hit the sand. Don’t pack anything the ship will provide for you. Most cruise ship cabins are already equipped with shampoo, body wash and conditioner, as well as tissues, beach towels and hangers. There is no need to pack along these items when they’ll already be waiting for you on board. Be truthful about how you want to spend your cruise vacation. If you plan on spending most of your time by the pool, you may need an extra swimsuit, but you won’t need extra shorts or additional tops. Keep in mind your shore tours when packing as well, and don’t take what you don’t need. Of course you want to capture the fun moments of your cruise with a series of snapshots, but most smartphones have cameras that can take photos perfectly good for sharing on social media. There is no need to pack along a bulky extra camera if you aren’t a professional photographer. You may want to bring along books, DVDs or other entertainment on your cruise. Don’t pack bulky items, though, and instead download your favorite books, shows and movies onto a tablet or phone to reduce what you pack and save space. If you want to bring along specific products, such as soaps or shampoos, opt for travel sizes rather than full-size bottles you won’t finish during your cruise. If your favorite products don’t come in travel sizes, buy small bottles and decant what you need into smaller sizes. Travel sized toiletries can be purchased from Amazon right here. If you take daily vitamins or medication, count how many you need into a small bottle instead of bringing more than you will need for your cruise. Of course you will want extra in case of delays, but it is unlikely that you’d need to bring a full month of medication for a shorter cruise. Planning your daily outfits before you travel can help you keep from packing clothes you won’t wear. Check out the dress code for your cruise line to be sure you have the right attire, but don’t pack so many options that you’ll be struggling to fit extra clothes in the tiny closets. Browse all this Cruise Wear from Amazon for your next vacation at sea. When choosing your cruise clothing, opt for versatile selections that can be reworn with different accessories or matched up differently to create different looks from the same clothes. The same is especially true for bulky shoes – only bring shoes you will definitely wear more than once. If you’re traveling with friends or family members who share your sizes and style, consider swapping clothing throughout the cruise so you have more options without adding extra luggage. This is especially true for children who may be able to share clothes for different looks with ease. Get all your cruise travel accessories from Amazon by clicking here. Cruise ships always have small laundry rooms available for passenger use, or you could opt for the dry cleaning or valet laundry services. This will allow you to rewear outfits even if they’ve gotten excessively dirty, and you won’t need to pack extras for a longer cruise. Before you put anything in your bags, make sure you will absolutely use it on your cruise. For example, ladies may not need products for their menstrual cycle if there’s no chance it will happen during their cruise. Extra makeup, jewelry options, multiple ties and other non-essentials can also be trimmed. It can be difficult to unplug while on vacation, but minimizing the devices you bring on a cruise can help you tune in to what’s happening around the ship rather than staying glued to a screen. Similarly, bring chargers and cords that can be shared between devices to minimize accessories. A cruise is supposed to be relaxing, so don’t feel guilty about leaving work at home. That includes the laptop or paperwork that might be essential for work, but certainly isn’t needed for a getaway. Cruise ship internet is slow and expensive, anyway, so leaving work home will save more than just space. Don’t duplicate anything in your luggage. Nights may get cool even in the Caribbean, for example, but do you really need both a light jacket and a sweatshirt? What about those extra glasses you never wear, or a second swimsuit when you usually only visit the pool once? Leave the backups behind. It isn’t necessary to pack along your entire bathroom for a cruise. If you only use a foot scrub, deep conditioner or face mask once a week, for example, see if you can go without when you’re on your cruise and you’ll save space in that tiny bathroom. Small travel toiletries are suggested, take at these handy bags to put them in. With so much food available on a cruise, don’t stress about bringing snacks along. You can always get ice cream, pizza, cookies, room service and more if you’re ever a bit peckish, without needing to haul along extra food in your luggage. The same goes for soda and water, which you can get on board easily. 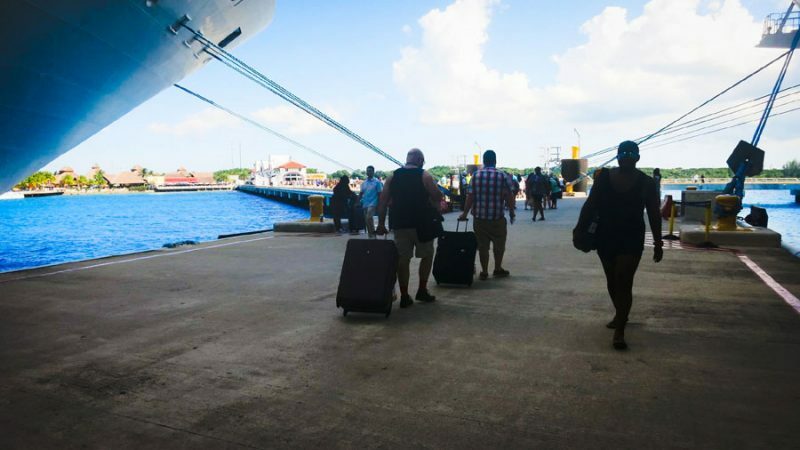 Be aware of prohibited items that you aren’t allowed to bring on a cruise ship, and save space in your luggage instead of packing items such as candles, scooters, drones, pool toys and other unwelcome items. Check your cruise line for the exact policy on which items are not permitted on board. While prices may be higher, it can be easier to get some items – such as large bottles of sunscreen – on the ship. You can even save room in your luggage and opt to wear souvenir shirts that you buy along the way instead of packing more clothes. When you think you have selected everything you want to pack, spread it all out before adding it to your bags. This will help you evaluate your choices and ensure you aren’t packing any duplicates or unnecessary items. Try to eliminate a few extra items before you put anything in your luggage. Waiting to pack at the last minute will make you feel panicked and rushed, and make it more likely that you overpack for your cruise. Instead, start packing several days early so you can make better choices and don’t feel pressured to pack more than you really need. When you are ready to pack your bags, use every bit of available space wisely. Pack socks or underwear inside shoes, for example, to save space and help your shoes keep their shape. This will help you fit everything you need into a smaller bag that will be easier to handle. While not every tip will work for every passenger or every cruise, with so many different ways to pack less, you’re sure to find some ways to trim down your luggage so you have less hassle and more space to enjoy during your vacation, no matter where you are sailing.